Cameron Flaherty and take place in the town of Westbury, Massachusetts. Mulch Ado About Murder, book five in this popular series, released in May, 2017. 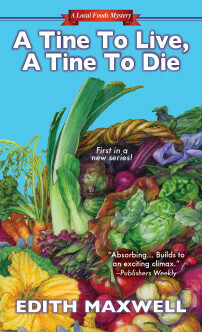 When a local farmer is found dead in a vat of hydroponic slurry, there’s no shortage of suspects, including the dead woman’s embittered ex‑husband, the Other Man whose affair ruined their marriage, and farmer Cam’s own mother. Murder Most Fowl came out in 2015. When a cold-blooded killer puts the big chill on the residents of Westbury, Massachusetts, organic farmer-turned-sleuth Cam Flaherty has to set aside her seedlings for the time being as she tills the soil for clues in the mysterious death of a local poultry maven. 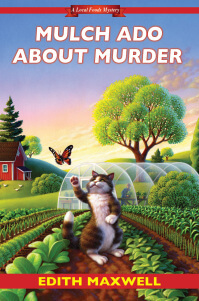 Edith Maxwell was interviewed about the third book in her Local Foods Mystery series, Farmed and Dangerous. Blog with the goal of introducing readers to authors and their work. American weekly trade news magazine targeted at publishers, librarians, booksellers and literary agents.